So I was walking through the Lesley University campus this morning and saw this. In front of Lesley’s 35 Mellen House residence hall. 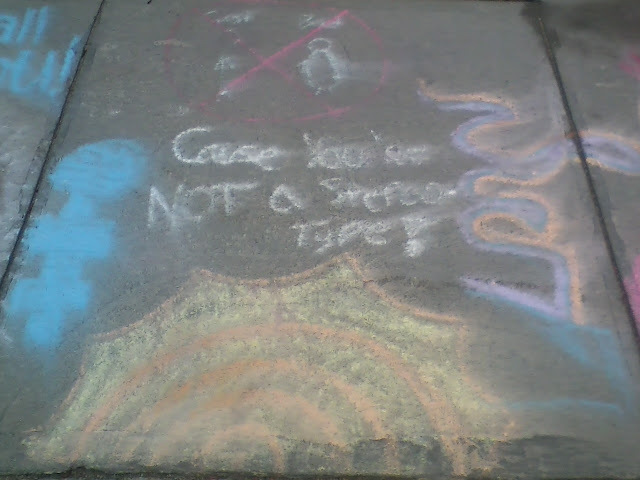 Several adjoining sidewalk panels had been decorated with chalk – most with the usual images celebrating Spring etc., some with good if vague self-esteem things, and some bits with more specific stuff. It rained last night, and I was using the camera in my non-smart phone, but. This was my favorite part. My favorite bit is at the top – a stick figure with “Good” above it, a very fat figure with “Bad”, and the whole thing is circled and crossed out with red. And below that it says “’Cause you’re not a stereotype!” Below that, at the bottom, is a sun. I don’t know what the blue thing on the left is. A female symbol with two bars instead of one? I think the thing on the right is an abstract design, but it could be a snake or something. Anyway, yay! Also, it seems particularly bashert because my destination was a bit further up Mellen, and if I had taken one of my usual or “best” routes I would have missed it.